NAPERVILLE, ILL., January 29, 2019 — The ongoing push to customize the viewers’ experience and the aggressive spend for content development by digital players is dramatically driving compensation for business development, programming and installation jobs in the cable and media industry. Today Content & Connectivity Human Resources (C2HR), the association formerly known as CTHRA, released the results of its latest Annual Compensation Surveys, which also revealed that programmer compensation grew robustly for executives and operating support personnel, while management gained larger salary increases at multiple system operators (MSOs). There were 59 participants in the 2018 surveys, including 14 MSO, satellite, telecommunications and home security companies and 45 cable programmers, broadcast networks and digital content creators. New participants included: ADT, BBC Studios America Inc., Fanduel Group (TVG Network), Game Show Network LLC and Google LLC (Google Fiber). “C2HR’s Annual Compensation Surveys uncover market pressures and valuable metrics that our members use to ensure competitive compensation strategies,” said Pamela Williams, CAE, C2HR’s executive director. “The skills, abilities and talent of those in technology, sales, customer service, network readiness, network operations and a host of other functions are key to delivering content anywhere, anytime whenever the customer expresses the want, need or desire,” he added. For content developers, the largest base salary increases occurred for positions in business development and programming (see Figure 1). For example, base salary for executive vice president (EVP) of business development (BD) soared by 10% over 2017, while BD managers, directors and individual contributors (ICs) saw gains of 9%, 7% and 7% respectively. These individuals are responsible for securing new content partnerships, co-branding agreements and user acquisitions (i.e., “more eyeballs watching your content”). 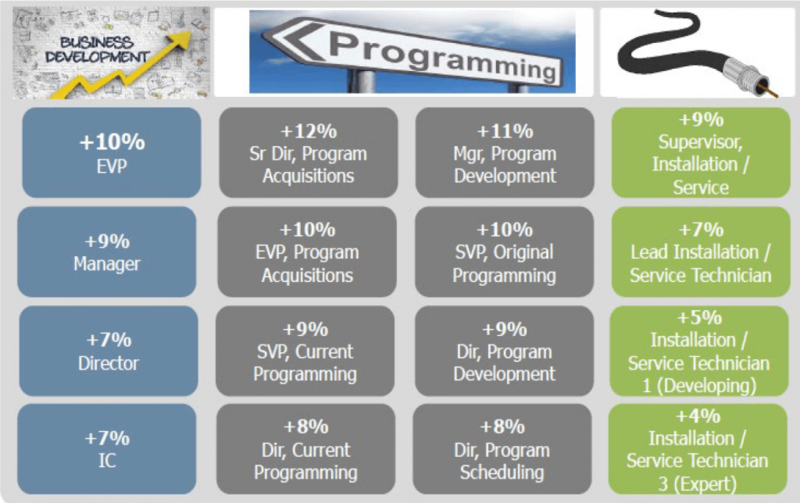 Base salaries for numerous programming jobs also increased dramatically, climbing by 8% for director of current programming and director of program scheduling while skyrocketing by 12% for senior director of program acquisitions. “If Netflix and Amazon are making a huge spend in programming and they are picking off your top people, then programming talent becomes scarce. Those jobs become hot,” said Croner. Such scarcity spurs compensation. MSOs also responded to competitive pressures, such as Charter’s and Amazon’s move to increase their minimum wage to $15 an hour and a national unemployment rate that’s hovering at 3.7%, a near 50-year low. Among MSOs, installation jobs achieved the largest raises. 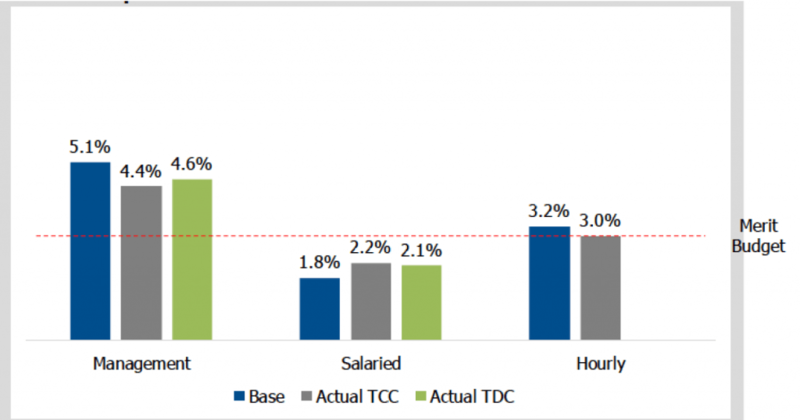 Base salaries climbed by 4% for installation/service technician Level 3 to 9% for supervisor of installation/service (see Figure 1). “There is greater emphasis on the technician as the last face and influencer the customer encounters before, during and after believing in and purchasing our products,” said Cox’s Scott. Increases for hot jobs occurred against the backdrop of a 3% salary merit budget for the industry, slightly higher than the 2.9% national average. Programmers reported total compensation exceeding the budget in all employment categories. 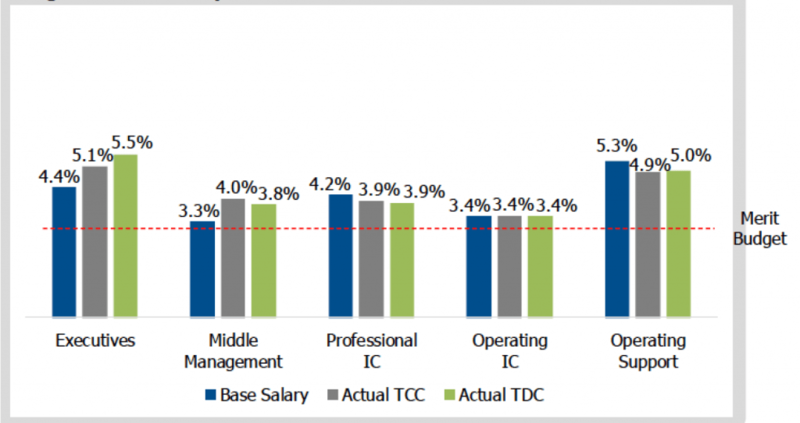 Programming executives garnered the greatest gains, achieving a 5.5% increase in total direct compensation (TDC), which includes all three elements of compensation — base salary, bonus and stock incentives (see Figure 2). Operating support personnel, such as technical directors and camera operators, accrued 5.0% TDC, while operating ICs earned 3.4% TDC. At MSOs, management, which includes supervisor through EVP, achieved the greatest gains: 5.1% base salary increase and 4.6% TDC. MSO salaried employees fell below the merit budget at 1.8% base salary increase and 2.1% TDC raise (see Figure 3). These increases indicate a responsivity to market conditions. “Companies are paying attention to people who are long-term contributors and taking care of them,” explained Croner. Geography continues to impact salaries for MSO installers and service technicians. Base salaries were higher in the West by 8% (lead) to 16% (expert) and East by 3% (developing) to 12% (expert), while MSOs in the Southwest, Mountain, Midwest and South reported lower salaries for installers and techs. For companies that participated in both the 2017 and 2018 C2HR Compensation Surveys. For companies that participated in both the 2017 and 2018 C2HR Compensation Surveys; excludes sales positions. Represents incumbent weighted average movement. To ensure continued relevancy of C2HR’s Compensation Surveys, each year participants meet to hone job families and position titles for data collection. The 2018 surveys collected data on 337 MSO positions and 532 programmer positions, an increase over last year. The programmer survey also continued to collect international salary data. MSO participants added two new job families and 19 new positions to the 2018 survey. Many of these support today’s reality of content anywhere, anytime; new technology-dependent service launches; and entry into new sales channels. New MSO job families include: wireless engineering and store retail sales. New positions include: associate wireless engineer to VP of wireless engineering, manager of home security installation/ service, program acquisition analyst/coordinator, manager of store retail sales, supervisor of master control and manager/director of workforce and traffic management. Programmers and broadcasters added six new job families and 47 new positions. These jobs reflect the critical need for data to support over-the-top (OTT) content delivery, marketing to OTT viewers and creative advertising sales strategies. Job families included: styling, digital production technology, effects artists, business intelligence engineering, advertising solutions, and extract transform and load developing (data management). New positions include: manager to VP of business intelligence, associate marketing strategy IC to SVP of marketing strategy, senior photographer to VP of photography, stylist/senior stylist, manager/director of media operations, VP library and digital assets, effects artist and manager/director of motion graphics design. “Even though programmers are making really strong shifts, they can’t match what strong digital payers will pay,” said Croner. 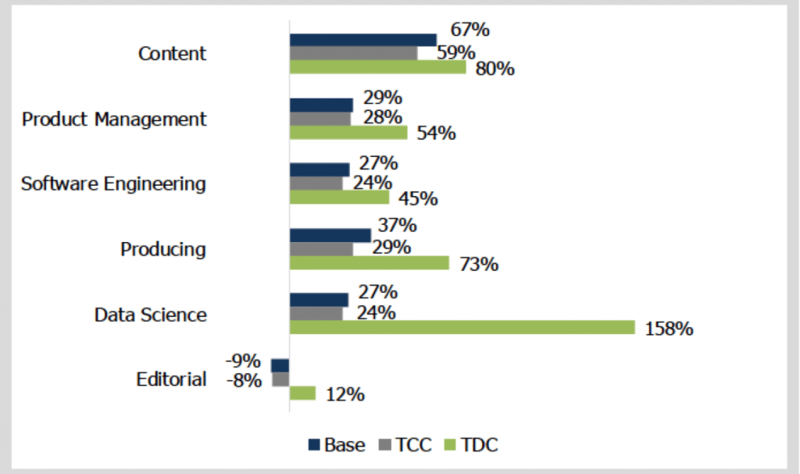 According to the Croner Company’s 2018 Digital Content and Technology Survey, TDC at digital and technology companies ranges from 45% more for software engineering, to 80% more for content talent, to an astounding 158% more for data science jobs. “Digital companies live off data science. They will find and keep those people with big packages,” Croner added. The industry continued its broad-based support for short-term incentives or bonuses. 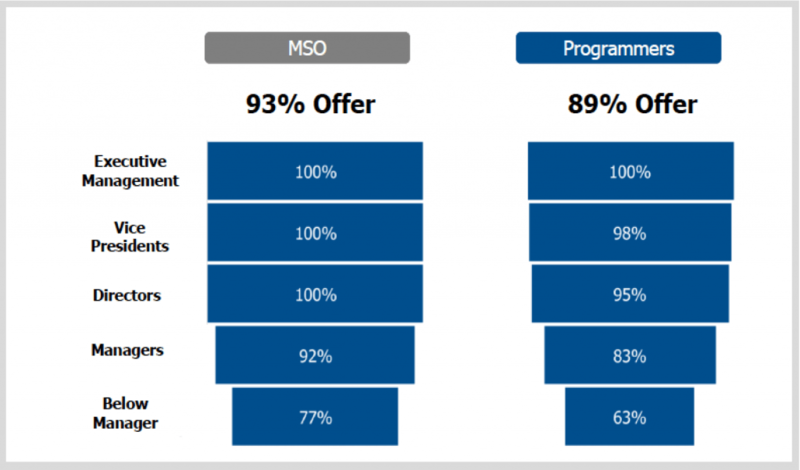 In 2018, 93% of MSOs offered bonuses, as did 89% of programmers. 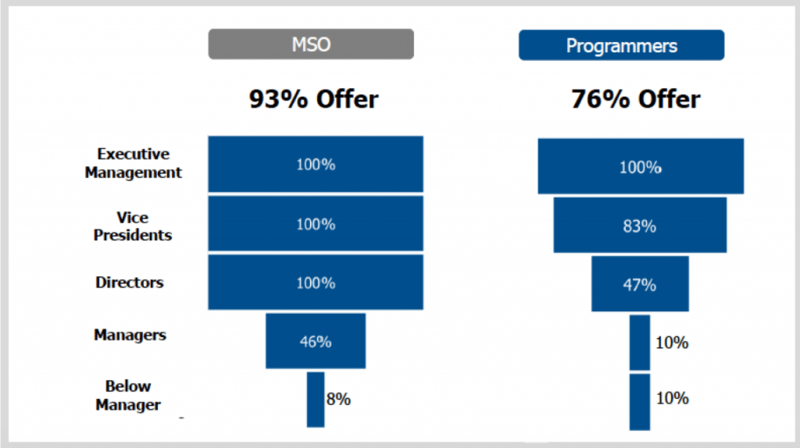 Eligibility reached deep into the organizations, as 77% of MSOs and 63% of programmers offered bonuses to employees below managers (See Figure 5). Once again, long-term incentives (LTIs) such as shares, stock options and long-term cash remained largely limited to management (See Figure 6). At MSOs, 93% of participants offered LTIs, with 100% of directors, VPs and executives receiving incentives.). Among programmers, 76% of participants offered LTIs in 2018, although penetration was less consistent than at MSOs, as 100% of executives received LTIs, compared to 83% of VPs and 47% of directors. This year, 8% of MSOs and 10% of programmers extended LTI eligibility to employees below managers. Cable employers continued to primarily offer full-value shares rather than options or cash. Four years ago, C2HR, recognizing the expanded notion of compensation at digital companies, began collecting data on amenities. In 2018, the industry offered more perks to compete with digital. For the first time, 14% of MSOs reported offering free food as did 16% of programmers, compared with 56% of digital natives (see Figure 7). Enhanced work environ-ments continued to be popular with survey respondents, as 86% of MSOs and 76% of programmers supported them. Gym member-ships also increased to 50% for MSOs and 29% at programmers (see Figure 7). Telecommuting remains a complex issue for the industry, and mostly offered on a case-by-case basis. 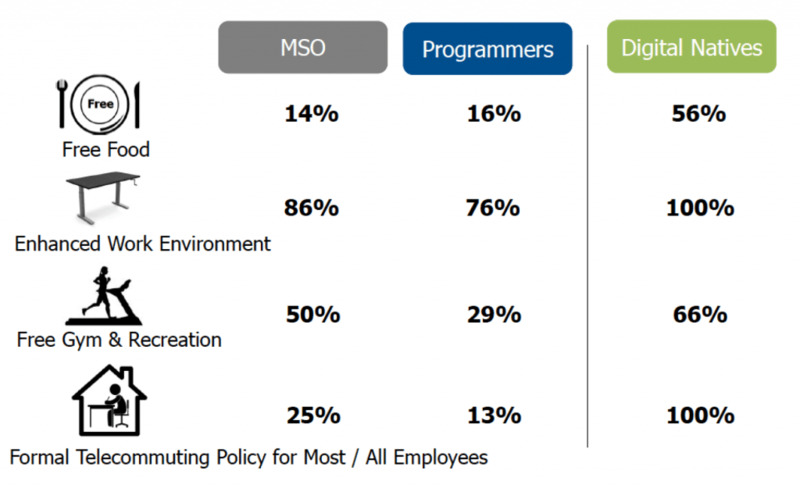 Although 100% of digital natives provide a formal telecommuting policy that applies to most or all employees, only 25% of MSOs and 13% of programmers had such policies. The pressure to deliver new content anywhere, anytime will not soon cease. “The playing field is increasingly competitive, and that will continue — aggressively,” said greenlightjob’s Kaye. The industry must, therefore, think creatively about compensation packages. C2HR’s 2018 Compensation Surveys included 59 participants including 14 MSOs and 45 programmers. The survey results are industry-specific, providing an in-depth analysis of pay practices for roughly 205,770 incumbents, including both exempt and nonexempt positions ranging from technicians to top executives. The participants submitted data reflecting 2018 budgets, base compensation figures, amenities and benefits.